Stressed about finding a job after graduation? Or an internship for the summer? 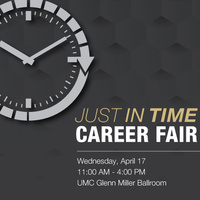 Then don’t miss our final career fair of the year! We’re bringing more than 100 employers from every industry to campus for one more day of networking. It’s open to students and alumni from all majors, experience levels and backgrounds. Dress professionally and come prepared with copies of your resume and your best elevator pitch. Bring your Buff OneCard to enter the event. Have a question? Career Services will provide drop-in hours in the UMC from 11 am - 4 pm today!